Emergency dentures available in Kingston, London everyday 9am-10pm. At Pearl Dental Clinic have the expertise and equipment needed to carry out emergency denture repairs. In addition, we are also able to create replacement express same-day new dentures. Due to the fragile nature of dentures, they can be easily broken if dropped. Many years of daily denture wear and tear may have a negative effect on dentures as talking and chewing both exert pressure on them that can ultimately result in them snapping. How does the denture repair process work? During the consultation visit, we are able to let patients know the extent of the damage caused to their denture and inform them of the best course of action to take. Cracked dentures can sometimes be repaired and can typically be bonded back together. Similarly, fractured denture teeth are fairly easy to mend. Shattered dentures are often problematic to repair. Although this is not always impossible. 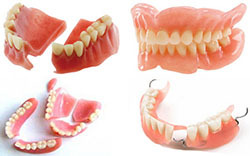 Patients should bring in all the pieces of their broken denture to the consultation visit. With very worn down, very old dentures, sometimes its better to replace the denture than to repair it. Although we will discuss all options available to you during your consultation visit. Even if you are thinking of replacing your fractured denture with a new denture, its a good idea to bring your old denture to the consultation visit as we may be able to repair it for you if you wish and you could use it as your backup denture. At Pearl Dental Clinic we have an on-site denture technician which means we can carry out denture repairs or make express new dentures, 7 days a week.